Most entrepreneurs go into business in order to take control of their own time and finances, but so few actually manage to cut their working hours enough to have any more free time. In this episode, we’re going over a simple order of operations that will help you to cut obligations, delegate tasks, become more efficient, and ultimately free up more time. Are you an entrepreneur who started your own business so you could have more income and more freedom? And have you reached those objectives yet? Or are they simply things you might like to do in the future? Many entrepreneurs I've talked to have figured out how earn as much as they need, and how to earn additional income. However, most of them have not figured out how to turn that income into a better lifestyle – and how to get more freedom for themselves. It’s easy to get caught in a trap: you’re a small business owner, and as the business gets more successful, you make more money. But you also have more clients, more responsibility, and more people counting on you. Life becomes crazy. You can’t let go of clients, because if you don’t have enough clients, you don’t make enough money. But if you have too many clients, you’re too busy, and you don’t have time for your family, friends, or fun. The good news is, there’s a simple order of operations that can help get you out of this bind, and help you get to a 4-Day Work Week as quickly as possible. What do I mean by an order of operations? In math, you might remember, there’s a correct order to solve equations in. I learned it with the mnemonic “Please Excuse My Dear Aunt Sally” which stands for Parenthesis, Exponents, Multiplication, Division, Addition, Subtraction. 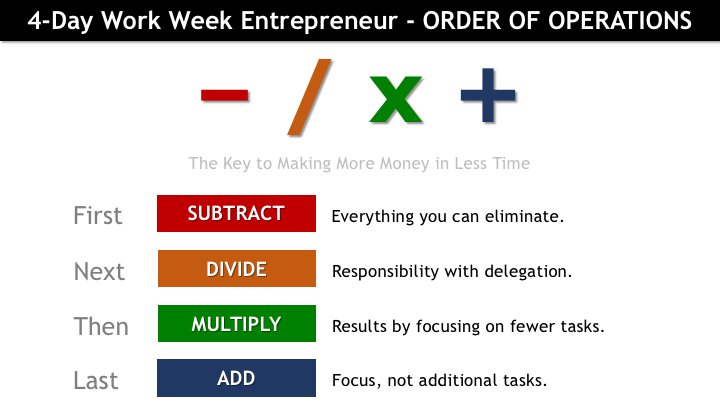 The 4-Day Work Week order of operations is just the same concept. It’s really a way of summarizing the best way to make more money in less time. A lot of people have a hard time with this, because they think they’re already doing everything they need to do, and everything they do makes them money. But is this really true? Look at your schedule – do you know how you're spending your time? Most entrepreneurs don’t. Do you know how many hours you invest in each of the different streams of income you have? Again, most entrepreneurs don’t. I’ll give you a simple example. Say you sell apples, oranges, and bananas. You might say you make a living selling fruit. But if we look more closely at your sales, each kind of fruit makes you a certain amount of money, and that makes up a proportion of your income. Let’s say you were dividing your time evenly between selling apples, oranges and bananas: one day on each, with the remaining 2 days on accounting, marketing, and everything else you need to do. Now, imagine the bananas just weren’t working out for you, and they were making you much less than the other kinds of fruit. You’d probably decide to stop selling bananas, right? And that would free up that day that you had been spending on bananas – now you’re working a 4-Day Work Week! Your business is probably more complex than this example, but sometimes it really is as simple as eliminating what doesn't work. I've seen small business owners go from 70 hours a week to 30 hours a week in a very short period of time. And when the change is that dramatic, it's almost always because there was some marketing pet project, or advertising thing that they were hoping would work, but that was just draining their time and money. But until you track where you’re spending your time, it can be difficult to see which tasks you should cut. There are certain tasks you have that are low dollar tasks: $10 or $15 an hour tasks. Say you're making $30 an hour on average; if you work 40 hours a week, which is 2000 hours a year, and you're making $60,000, then you're making $30.00 per hour. Any work that you have that's worth less than $30 an hour, you should be delegating to somebody else if at all possible. Find someone you trust, and delegate the work to them in order to free up more of your time. Going back to the example with the fruit, if the bananas aren't cutting it, just focus on your apples and oranges. Most people have only 2 or 3 things that they do that really make them money. Many top performers know this, whether they’re athletes, actors, singers, or anything else. A singer might make money setting up the stage and carrying equipment, but they definitely get paid more for doing what they’re good at: singing. If they can pay someone else to do the other work, this frees up more of their time and energy to focus on what they’re good at. Whatever your equivalent might be, there are usually higher dollar, and higher-impact tasks you can be doing, and lower dollar, lower-impact tasks. Most of the time, the higher dollar, higher impact things are more challenging, they're more fun, they're more engaging, and they're a better way for us to invest our time. A lot of the time, when people free up time, the first thing they do is try to fill the time with more work. But actually, it might be that you just need to take the extra day off, especially if you're working 6 or 7 days or 60, 70 hours a week. It might be as simple as you stop working Saturday and Sunday, and subtract 20 hours of work, adding rest in its place. That way, you’ll come back more focused on Monday. So many of us work in fields that are based on intellectual information, knowledge and processing. If you worked with your body, you would know that your body gets tired, and perhaps it’s easier for us to understand that when our body gets tired or injured, we need to take a break. But when our brain is off-focus, it's not as easy for us to detect. Luckily, adding focus can often be as simple as having fewer tasks, so that when you do a task, you really focus in on that. You don't do your email at that time, or check Twitter, or update the books. You focus in on your one important task, and you do just that, for a small period of time. Usually it's best when you do things like that first thing in the day, when you have your most energy, most focus, and you can always get to the less important things later on. As we’ve seen the way to move towards a more productive business, and more free time, is as simple as subtract, divide, multiply, and add. This is all about being more productive and getting better results, which is something that all businesses want. I hope you found this advice helpful. If you're looking to plan your 4-Day Work Week, whether you're an entrepreneur, a business owner, or an employee, at some point you're going to have to decide and map out what you want it to look like. To create your free 4-Day Game Plan, head to 4daygameplan.com, where you can find the training videos and the tools to help you set this up. If you have any questions on this topic, let me know. 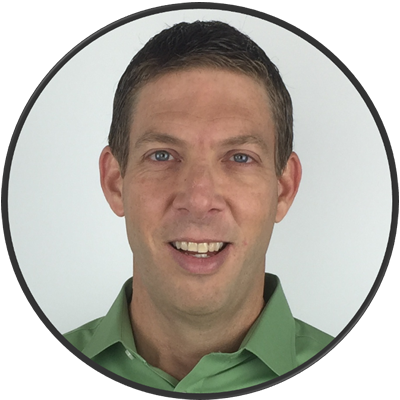 As always, I look forward to helping you make more money in less time doing what you do best.